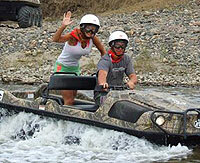 Enjoy the extreme side of nature aboard your 8-wheel amphibious all-terrain vehicle. Crossing plantations, the tropical jungle and the fresh waters of Ameca river, this is a never-before-experienced adventure that will make you feel the adrenaline on a safe and fun voyage through the wilds near Puerto Vallarta Mexico. The tour begins with transport to Rancho NayJal, outside of Puerto Vallarta, where after instruction you'll explore open fields, sandy riverbeds and even splash and float through creeks in your all terrain vehicle. You can make 360s, jump sand bumps, and spin in the mud, it will leave you squealing with delight! You can take turns driving, or you can let your guide drive if you prefer. No highway driving, it's all backcountry fun! After the tour, you can enjoy Mexican snacks, beer or soft drinks at the ranch. A totally unique experience, one of the best tours in Puerto Vallarta! Camera - We recommend a waterproof camera. Look at the photos and you'll see why! We recommend a swimsuit or shorts - you can guess why! Departs From: Plaza Los Toros La Paloma in Puerto Vallarta and Restaurante Almendritos in Nuevo Vallarta. Kids: Ages 12 and up. Drivers must be 16 years old and have a valid drivers license. Qty is the number of ATVs you want. 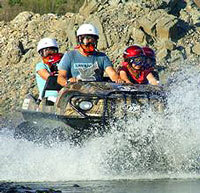 If two people want to ride on one ATV, choose a Qty of 1, 2 Person ATV, and "Book Now". If three people want to ride in the same ATV, click "Add More Tours" in the shopping cart, and add them to your cart too, choosing Qty of 1 with a 3 Person ATV. PLEASE BOOK THE 1:00PM START TIME. 9:00AM WILL BE DIFFICULT FOR YOU TO MAKE THE TOUR ON TIME.